Low Mileage, Leather Seats, Heated Seats, Rear View Camera, Bluetooth, Climate Control! Compare at $22648 - Our Price is just $21988! 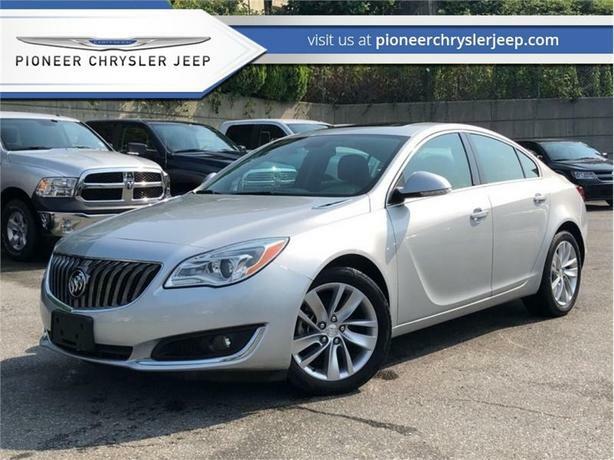 The 2016 Buick Regal is a great choice for those looking for an sporty yet well appointed mid-size luxury sedan. This 2016 Buick Regal is for sale today in Mission. One look at the Regal midsize sport sedan, and you'll instantly remember every thrilling drive you've ever taken. Bold exterior styling lines let you know that it's as eager as you are to push the limits. Design details like its chrome accents add a confident flair, while the exceptionally well-crafted headlamps and tail lamps leave a lasting impression.This low mileage sedan has just 20540 kms. It's grey in colour. It has an automatic transmission and is powered by a 2.0L 4 Cylinder Engine. This vehicle has been upgraded with the following features: Leather Seats, Heated Seats, Rear View Camera, Bluetooth, Climate Control. It has some remaining factory warranty for added peace of mind. Our Regal's trim level is Base. Our 2016 Regal comes with dual-zone automatic climate control, 18-inch alloy wheels, Buick's IntelliLink multimedia system with a 7-speaker audio system, OnStar, SiriusXM satellite radio, leather seats with heated front seats, Bluetooth streaming audio and a backup camera to help when reversing in and out of a tight spot. / Total cost of borrowing $4719 ). See dealer for details.